Come check out our Pond Plant selection! A varied selection of plants has impact not only on the beauty of a pond but also on the water quality. 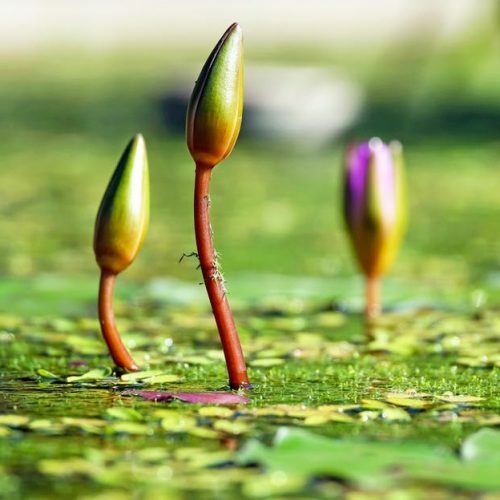 There are four basic types of pond plants. For an attractive, well-balanced pond, we recommend using a mixture of all four types. 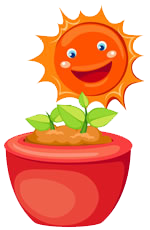 Below you will find a description of the different categories of plants and the ways in which each group will assist you in maintaining a healthy environment. On the Healthy Ponds handout we will give you additional tips on pond care. The largest palette of plants falls within this group. These plants grow in shallow water or saturated soil around the perimeter of ponds or along the banks of streams. They frame the water feature, soften the transition between land and water, and provide an attractive backdrop to small ponds. Their function in the pond is primarily ornamental. However, if you grow marginal plants in mesh baskets filled with gravel or aquatic soil, their hungry roots will grow out of the containers and pull nutrients directly from the pond water. More effective yet, you can grow plants directly in gravel planting beds built into the pond. This creates natural bio-bogs within the pond which remove nutrients and provide an expanded area for beneficial bacteria to colonize. This group of plants grow beneath the surface of the water where most or all of their foliage remains. The name “oxygenators” is used because they release oxygen into the water during the day. 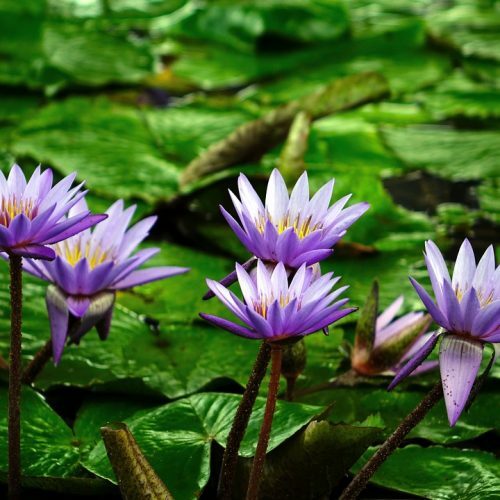 The primary function of these plants is to remove excess nutrients from the pond, thereby reducing the growth of algae. They also provide spawning areas and protective cover for fish. Most of these plants are grassy in form and are sold in tied bunches. The most popular native submerged grass, Hornwort (Ceratophyllum demersum), can be either free floating or anchored in a pot of gravel. Additional favorite potted oxygenators are two varieties of Arrowhead (Sagittaria natans & S. graminea) and Tapegrass (Vallisneria sp.). These plants float freely on the water surface and reduce algae by competing for nutrients, shading the water to cool it and lowering the light penetration. 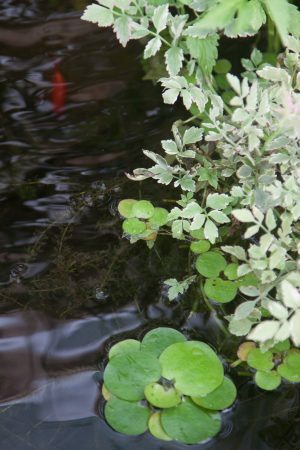 Most floaters are tropical and those should be removed from the pond and composted prior to the onset of winter. The most popular floater is the Water Hyacinth (Eichhornia crassipes). This rapidly multiplying plant develops a strong trailing root system which removes excess nutrients and pollutants from the pond. Due to their natural filtering ability, they are commonly used for water purification at treatment plants in the southern states. Occasionally hyacinths will develop a lovely orchid-like flower. 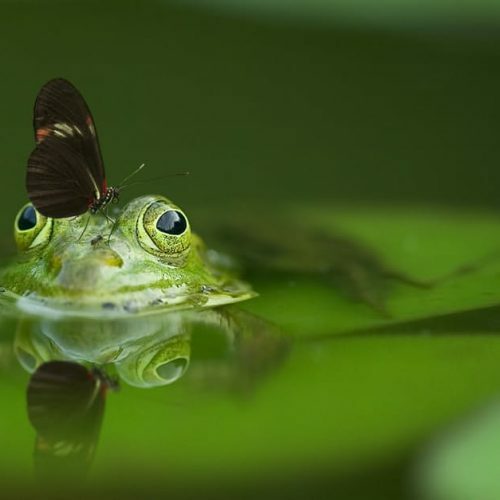 Other popular floaters are Water Lettuce (Pistia stratoides), Frogbit (Limnobium spongia) and the tiny floating plants, Duckweed (Lemna minor) and Azolla (Azolla sp.). The primary benefit derived from floating-leaved plants is the surface shade they provide. These plants root on the bottom of the pond and send floating leaves up to the surface. Everyone’s favorite pond plant, the Waterlily, is in this group. You can keep waterlilies in pots or build planting beds right into the bottom of the pond. Waterlilies grow in water up to about 3 feet in depth. In the Pacific Northwest, with our cool nights which keep water temperatures low, we feel that most waterlilies are happiest at depths no more than 18 inches to 2 feet. At these depths the sunlight penetration is better and the water is warmer. There are also miniatures which can grow in as little as 8 inches of water but must be moved to deeper parts of the pond for winter protection. Any hardy waterlilies will die if ice is allowed to touch the tops of their tubers. For winter, a great plant choice is the Water Hawthorne which flowers in late fall or early spring.